Can You Spot The Genius? I like this picture so I'm randomly posting it here. Sitting around in a (virtual) table, the BFB mods were (kind of) discussing how we will bore you next. What, with the international break upon us and what not. Calvin was too busy saving children from burning buildings to comment. “I have this great idea about football and genius and Steve Jobs, but people will call me stupid,” Kxevin sighed. SoMa was too busy writing a NY Times best seller, keeping her students honest, and explaining the pros and cons of a 3-4-3 to her Hunky Soccer Husband in verse to comment. “World Cup. Rugby. All Blacks.” Linda muttered. Euler was too busy traveling the world and taking in the wonders of the universe whilst solving complex mathematical equations to comment. “Blame Keita!” a random insider shouted. They were promptly taken out by KFC (mhmm, chicken. No, actually, it’s the Keita Fairness Committee. They don’t offer cookies, but you get free chicken if you join. Eh). No one was really sure what Luke was doing*. *Rumor has it that he is currently trying to finalize Own Goal to Barca from Man Utd. Stay tuned). After (virtually) hearing everyone’s ideas, we decided that one can only blame Keita for so many things – ow, I stubbed my toe! Curse you, Keiteeeeee! – and so we (virtually) took a non-existent vote and decided to go with Kevin’s idea: about genius and footballers. I am a nerd. A total nerd. As such, I will now proceed to apply my nerdiness to football, and other things, for your reading pleasure. As a person in science, I know for a fact that when we’re not saving your life, we’re screwing with your mind using a variety of mediums, the most popular being our various theories and experiments. Of course, when your mind is well and truly screwed with, you come back to us and we treat you. (This is repeated multiple times). One of the most enjoyable ways we like to mess with your mind is taking things you’ve known to be fact and tell you, ‘actually… it’s not.’ For example, 1 doesn’t actually equal 1. It’s a rounded number. HA HA. And now, I’ll take the time and conduct a mini-experiment. Two children are given a simple division question. One child solves the question faster than the other. State which child is more intelligent and why. I don’t really blame you. Based on the conventional thought of what intelligence is/constitutes, most people are vindicated in thinking the child who solved the question faster (let’s call them Child 1) was the more intelligent one. I’m here to tell you that it might not be so black and white. What if Child 2 had more difficulty because they took a different, less conventional, approach to the problem? What if Child 2 was looking at and understood the problem and the division process at a fundamentally deeper level? What if Child 2, instead of just memorizing the answer like fecking Child 1, decided to use long division to solve the problem? Let’s try another scenario, one more relevant to this blog. Someone Xavi has the ball on the halfway line. Their team just regained possession and there are still opposition players in and around their half of the pitch. There is an open lane between them and a teammate further up the pitch near the goal. They decide to pass back instead of passing to the teammate. Was this an intelligent move? Why or why not? For some, this is a much easier question to ‘solve’. For others, maybe not. Let’s try another one: Is this guy an idiot? I’m interested in hearing your various answers, so I’ll leave these ones open-ended. (The first scenario is as well, by the way). Intelligence? You Can Have More Than One. Apparently. 1) Visual/Spatial, aka “picture smart”: Tend to think in pictures and need to create vivid mental images to retain information. Enjoy looking at maps, charts, pictures, and movies. elegant speakers. Able to comprehend and write well. 3) Logical/Mathematical, aka “number/reasoning smart”: Use numbers. Good at recognizing patterns, sequence of ideas. Able to think abstractly, reason logically, and solve problems systematically. Curious about the world around them. Asks lots of questions and like to do experiments. 6) Interpersonal, aka “people smart”: See things from other people’s point of view to understand how they think and feel. Encourage cooperation. Able to relate well with others and respond to and work with different types of people. Outgoing. Skills/traits include (but not limited to): Recognizing their own strengths and weaknesses, reflecting and analyzing themselves, awareness of their inner feelings, reasoning with themselves. For an example, take Leo Messi. He falls into the bodily-kinesthetic and visual/spatial category, as he can visualize the pitch in his mind and use his superior control over his body movements to get to his destination, but can also qualify for the intrapersonal one (he’s shy, and doesn’t like talking, but knows what he wants and how to get it). Pep also falls into bodily-kinesthetic and spatial, but also is also strong in interpersonal and linguistic (see acceptance speech for Catalan award and article written for El Pais). Someone like Steve Jobs hits all of them except maybe Musical and Naturalistic. Is a man like Steve Jobs smarter than Sacchi or, for an easier example, Messi? Depends on what the rubric is. Each is iconic in their chosen, and very different, fields. The term (insert sport name here) IQ is often used to describe someone who has above average positional sense and ability than other equally talented individuals. For example, in our lovable sport, we hear the term ‘football IQ’ everywhere. Xavi has a high football IQ. Messi has a very high football IQ. Pretty much everyone on Barca has a high football IQ. But for a comparison, someone like Gareth Barry [sorry, had to pick someone] has a lower football IQ than Xavi. Who doesn’t? Put the ball in front of them, and 99% of the time Xavi would pick the better and/or more ‘intelligent’ option. What makes Xavi constantly pick the right path, the right choice? Is it an innate, instinctual thing? That is to say, if you asked Xavi why he picked that pass, would he just shrug and say, “I just did. Because…it was just the right thing to do”? Or does he make each pass after instantly considering every option and choosing the best one? Malaga coach Manuel Pelligrini may be a civil engineer, but can he instantly tell the different types of mushrooms like Xavi can? I can solve a given trigonometric identity [not the I’d want to], but ask me what planking is – what the hell is that? – and I couldn’t say. 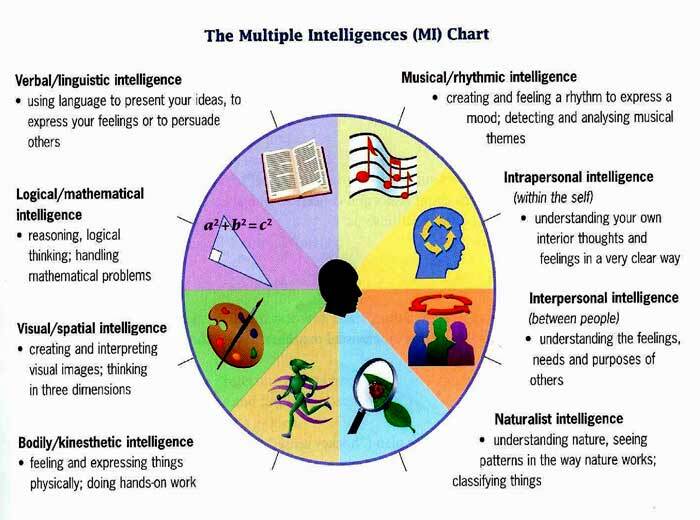 Of course, in this theory of multiple intelligences, there are obviously many things that are subject to debate. Some people feel that if someone possesses most, or all, of the different intelligences, they are a true genius. It means they are superior in every kind of way. Others feel that if one hits, or falls into, more than one category of intelligence, they are a well-rounded person. After all, shouldn’t everyone process a healthy portion of each intelligence? But it all depends, right? People have different opinions, and/or are forced to see things in a different way. I remember when I had to oversee a debate and the first thing I did was ask people to take a side, then I put them on the team that completely opposed that view. Why? Because you’re forced to consider things in a different way – gain a different perspective – so you become better-rounded as a result. So how do you define genius? I define genius as one who finds a way where there is none…who creates a path for others to follow…the one who takes the road less travelled by and there lays the concrete for a super-highway in the future! Terrific Post that is just weird to be in a Footballing community. I feel like Kari made the whole post just to share the Aguero and TB pics. Any channels in the US showing the Argentina Chile game tonight? Nevermind, found out it’s on Direct TV. My carrier, Comcast, is carrying it on Pay Per View for the low, low price of $29.99 + fees and taxes. ANGER!!! What good is this sports package anyway!!! Not even for Messi and Masche will I pay $29.99 for a soccer game on the tube. I hope someone posts links. Stuff is getting crazy. The rugby WC matches are $34.95! EACH! I saw that it was on DirectTV also on the live soccer tv schedule, but can’t find it in the Direct listing, does anyone know if it is a PPV or one of the other channels? This is a good introduction on what some of the possible intelligence options are. The circle in the figure above makes sense because that is what the author felt were quantifiable when they did the work. Intelligence is far more infinite than what is understood, and there are far more facets to it than what is represented above. Most of the new new work agree that intelligence comes as a result of persistence, perseverance, and hard work. There are several interesting books on this subject. The Genius in All of Us by David Shenk. Both the books explore in detail people who others consider geniuses and break down the process through which they were able to achieve this acclaim. The basic conclusion that both these books suggest is that it is the process in doing something, that will determine whether one will become a genius in what they are doing. Genius is not inborn. Now putting this all in context of Barca, Xavi Iniesta and Messi, who we all consider the top 3 players do not fit the profile of worlds best players in terms of the physique, height and other physical attributes. But together they are able to achieve on pitch what few other footballers can. And this is as a result of the “proces” that has gone into making them footballers(La Masia training), and a desire(persistence and perseverence) to improve. In case of Barca, they have taken intelligence a step further, Barca has devised a system where the collective intelligence of the team can magnify the intelligence of individual players and vice versa. Few other teams have been able to take collective intelligence to this level. Take Messi for example, take him out of Barca and put him in the Argentina squad. The results are far less compelling than what they are at Barca. I have often thought that it would be funny/instructive to put Messi, Iniesta, and Xavi in a large room full of men(Where’s Waldo style?) and say to one of the uninitiated(aka 99% of the population of my country(USA)), “OK, 100 bucks if you can pick out the world-class footballers.” Bet they’d be among the last to be picked. The same went with a dating site that put Bill Gates as one of the people in the list of pictures for girls to choose from, from a list of potential suitors. None of the girls picked Bill Gates. This was at the time he was the richest man in the world. Seems like there’s a post here for someone smart about the varying forms of genius. A colleague and I were discussing whether Jobs was in fact a genius. Obviously, we think of “genius” as being defined by intellect. But Messi, Xavi and Guardiola can be rightly be called “geniuses” in the same way as Jobs, right? A genius adapts to a situation and quickly resolves the best way around. We see American football players who aren’t geniuses, strictly defined by levels of IQ measurement, who can ingest a playbook, dissect it and figure out every permutation and how it relates to an offensive or defensive scheme in the mere seconds between plays. What makes Messi “know” the right path, when other players who might be every bit as talented but less “intelligent,” I also wonder if players don’t temporarily become “dumb.” Look at Messi’s recent run of clunky form. It’s almost like he’s forgotten how to play the game, where to be. You also wonder if the athlete’s intelligence/genius isn’t more instinct. Aren’t science nerds really geeks or dweebs rather than nerds(hence the old electronic engineering major’s joke of ‘there’s a EE in dweeb”)? Xavi is a football god geek of the and dang he looks good in the new black kit highest caliber! Xavi is the Aristotle of mushrooms football(which I guess makes Pep Plato and Cruyff Socrates), Messi is the Michaelangelo of football,and Don Andres is Einstien…Houdini…insert name of genius here___ of football? Eh…I think the term “geek” definitely has a social ineptitude nuance to it. Interesting, I’d much rather be called a nerd! I’m more on the social science/foreign language side of things though, so maybe it varies on the job sector. I’d compare Pep more with Da Vinci, always inventing, planning, observing, tinkering. Iniesta is Tesla. I can think of no higher compliment than that. And Kari is a sciencologist! Who knew? Just keep her away from the Bunsen burners, OK? Holy crap! 7 matches in 23 days! And then 9 between that break and Christmas! Add to it the fact that international breaks aren’t breaks for us because almost all of our guys are playing for their countries and for many of the league games we will be playing very well rested teams that aren’t in so many competitions and whose players aren’t called up for their NTs. Don’t we also have a problem with the fact that our first Copa game will be played during an international break where our first teamers AND our u21 NT B teamers won’t be available(much as I wan’t any and all silverware available, I’m beginning to think that this CDR thing no vale la pena)? It’s a sign of our success that we will be so busy but boy are we gonna have some burnt out guys! It’s not the CDR Copa, it’s the Club World Cup that has the conflict, I think. B teamers are available but is only allowed to call up a certain number (4?). I think it’s that the CWC is causing the CDR conflict. The Liga needed a time to schedule this game so they, in their usual display of brilliance( because hey, a Spanish team is representing our league in the CWC, so let’s penalize them rather than work with them), plopped the game there out of apparent “necessity”. La Liga…played by geniuses, run by idiots. My recollection of this is iffy. Hope someone else can clarify for sure. Anywho, it is what it is. Great article Kari! And speaking of genius, has anyone seen pep’s interview for a bank endorsement? He talks about stuff but what got my attention was the classic black and white setting and I must add pep looks even better without the skinny tie 🙂 Just simple and elegant! Wait hold up why am I now realizing that our Champions League Group are currently made up off domestic champions. FcBate, Viktoria, Milan all won their respective leagues. This make it like 3 years in a row UEFA has done us this. I cheated on my IQ test. All white uniforms for Spain? Is this some sort of Madrid joke? “We are the four ponies of the apocalypse!” Ahahahaha!!! Why didn’t Jordi Alba start today? Is he even on the bench? I really don’t understand what Del Bosque is doing at LB. Spain plays with such little width at baseline. With Arbeloa the problem gets much worse. They really need to start playing Jordi Alba or another player at LB. What opposition managers should do is to play Spain the way Valencia plays Barca. They should pinch the right side of their defense into the middle to overload the center. It really doesn’t make sense – there are at least 3 LBs better than Arbeloa! He’s being strangely risk averse. They’ve qualified – and easily. Try to make your team even better. Expand what you are capable to doing by mixing other players in to see what they can provide. Playing Torres makes sense as you really need to see what he can offer. But play Thiago. Play Santi – try moving him to an more advanced position like you do with Iniesta at times. Play Ramos at CB and see what you have in the way of other RB just in case there are injuries. If you are fully committed to playing a double pivot – try pairing Javi Martinez with Busquets in case the older Alonso gets injured. Continuity is critical to a national team. But Del Bosque seems to be saying that if we just keep doing what we’ve been doing we’ll win the Euros. Maybe that’s true. But I don’t see how it hurts to try to continue pushing to get better. Germany is not going to be easy to beat. And Loew is such a good tactician that he’s going to come up with a different wrinkle. He knows he spain is going to play. Am I wrong or hasn’t Spain qualified already? I don’t get Del Bosque. Yep, Spain qualified last game. And I think Jordi Alba is the only new player Del Bosque brought in for this game that’s just for talking points. Is that picture real?!! Ronaldo paying homage to The Adjective..
Just read on the club’s site that Bill Gates presented a barca shirt to Nigeria when he came last week in the fight against polio. We are indeed more than a club! Just came in. Who scored the goals? Mata and Alonso scored for Spain. It is very disturbing for me to see Puyol in white. Much more so than the other Barça players. Yeah, I much prefer the blue away jerseys. The yellow ones from 2008 were really nice too. Albiol at RB and Arbeloa at LB. There’s no reason to defend Spain on the flanks. Just play very narrow and break up midfield play. This is going to be an issue for them when they face better competition. If he’s not going to play two offensive fullbacks, then I think they should play two offensive midfielders and only one defensive midfielder. A Barcelona midfield of Ini-Bus-Xavi. Ramos doesn’t impress me too much offensively. I think his long term future is at CB. I think he should be Pique’s partner once Puyol steps down. For the LB spot, I don’t understand why VDB puts Arbeloa there. Jose Enrique, Jose Angel, and Jordi Alba are all more impressive, and all way more fun to watch. I love watching Angel play, I think he can be Spain’s future starter at LB. Silva is having a bit of a stinker, eh? Was he better in the first half? He created the second goal, but yeah, it seems that he’s trying a little too hard. That Puyol move just now though… so beautiful. Just kidding, that looked really painful, I hope he’s OK. I hope he’s OK. He was able to walk out at least, so that’s a plus. Also Jobs was an absolute genius when it comes to marketing, as a CEO and his vision on ease of use taking precedence over flexibility/fixability etc. in computing/electronics. His contributions in innovation and to technology (from industry/techie standpoint) are largely overrated however. But let’s not get into the discussion of that. What is interesting is that he was pretty high on all the forms of intelligence while probably not the best in any and was extremely successful. While if you are extremely intelligent in only one and useless in others (like savants maybe) not that successful. On another note, I would love to have an insane amount of stats thrown at me. 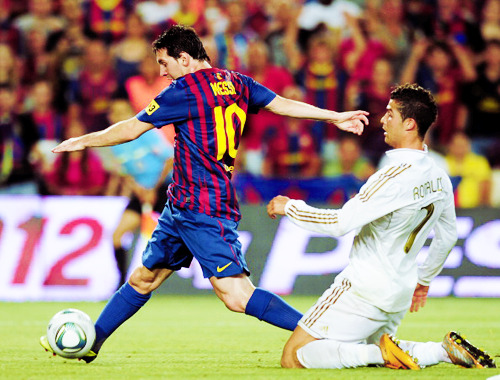 Messi seems to be enjoying himself this game and he must have over 10 assists this year!